16″ size 8 circular needles–1 skein Paton Encore Colors or Schoeller Stahl Big Mexiko or any worsted weight yarn. This one weighs 1.4 ounces and took less than 90 yards to make. Cast on 80 stitches. Join. This cap is knit in the round. Row 1: *K 1, yo, k2tog, [ p 3, k1]2x, p3, ssk, yo; repeat from * 5 times. Row 2, 4, 6, 8, 10, 12: Knit the knits and purl the purls of previous rows. Yo’s are knit. Row 3: *K2, yo, k1, p1, p2tog, k1, p3, k1, p2tog, p1, k1, yo,k1. Row 5: *K3, yo, k1, p2, k1, p2, p3tog, k1, p2, k1, yo, k2. Row 7: *K4, yo, k1, p2tog, k1, p1, k1, p2tog, k1, yo, k3. Row 9: *K5, yo, k1, p1, sl1, k2tog, psso, p1, k1, yo, k4. Row 11: *K6, yo, k2tog, k1,ssk, yo, k5. Row 13: *K7, yo, sl1, k2tog, psso, yo, k6. Continue to knit in the round for a total of 6″. Decrease: [K2, k2tog] to end. 60 sts. Knit one round even. [K1, k2tog] to end. 40 sts. Knit one round even. K2tog for next three rounds until 5 sts remain. Finish: That’s up to you. I-cord is good and so are worms. 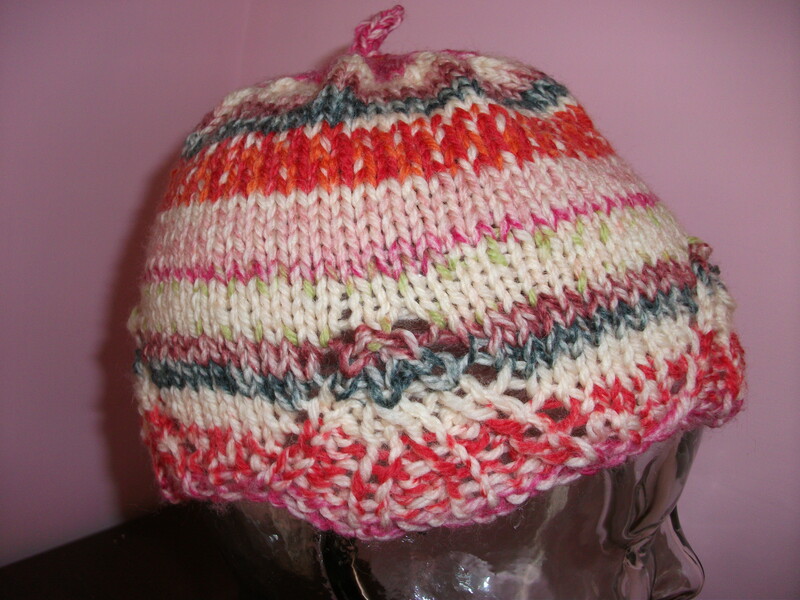 See Fluffy’s Slouchy Tam for worms. I would be happy to answer any questions. Feel free to leave a comment or write to: www.frivolousfluffy@gmail.com .